It’s nearly Halloween! The only time of year where I can dress up as a Goth again and not feel guilty! For those of you who don’t know, I used to dress rather “alternative” – I still listen to rock and heavy metal, in fact I’m going to Warped Tour in just over a week, but it’s no longer acceptable to dress all in black. A shame I know! 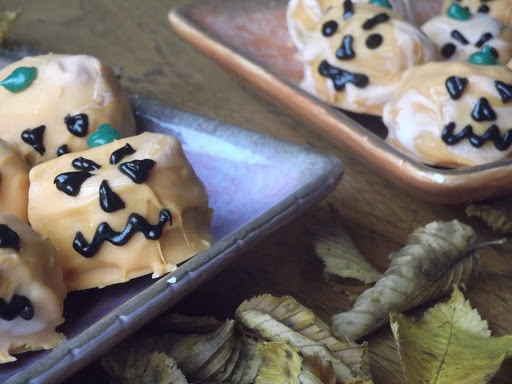 But, Halloween’s more than just a good excuse for fancy dress, it’s also a great excuse to do some themed baking, and this year is no exception. 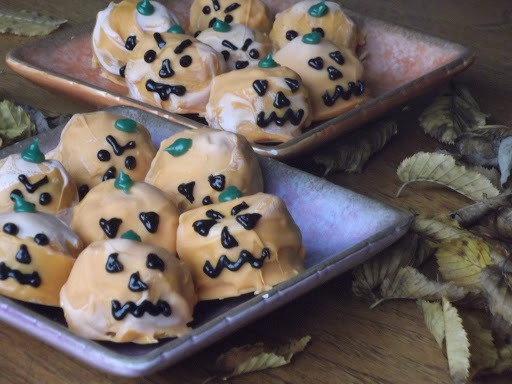 The idea was simple…make cake pops on a stick that looked like pumpkins; they would be perfect for Halloween parties being thrown all over the world. However, there were a few hiccups along the way. First of all, the flavour combination although DELICIOUS meant for a rather heavy cake pop and they simply wouldn’t stay on the stick no matter what I tried. So, rather than being on a stick, I simply made stand alone pumpkins which are just as cute and fun! 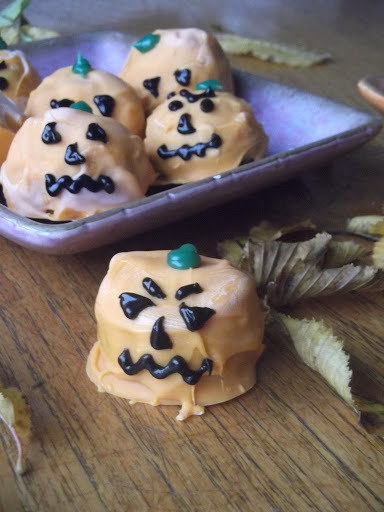 Also, I used orange flavoured candy melts instead of chocolate to cover them. Unfortunately I had to buy way more than I should have needed as the first lot burnt (despite following the instructions) and then the second lot bizarrely got a pale white coating, the kind that chocolate gets when it is old. I have spoken to Baking Mad/Silver Spoon but they assure me it’s me who’s using them wrong! (Unlikely considering I followed the exact same method THIRD time round and they were just fine.) Has anyone else had any problems with these candy melts?! Maybe it is me who’s in the wrong? But, enough about the issues I faced, fortunately I went through all the trials and tribulations so you didn’t have to! This recipe is fool proof and you’re guaranteed to have tasty cake pops that will impress your guests. 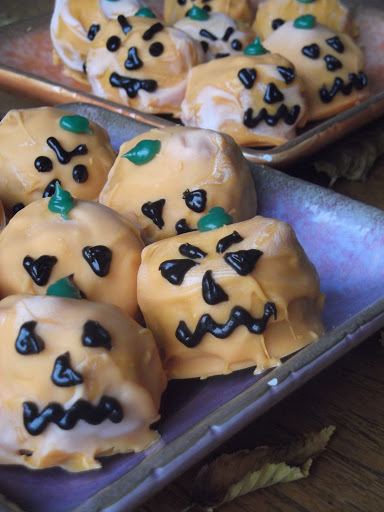 These pumpkin cake pops are the perfect spooky treat for the kids this Halloween! Crumble the cake into a bowl until an even consistency. You don’t want the crumb-like texture too fine, so try not to be too heavy handed, less is more! Next, stir in the buttercream. Again try to make sure it is mixed well and the butter cream is evenly distributed. Taking roughly a large tablespoon of the mixture at a time, roll the mixture into balls and place on to a sheet of greaseproof paper. Once you have rolled them all out place into the fridge for 5 mins while you melt the candy melts. Melt the candy melts according to their instructions. (I recommend doing this over a pan of simmering water rather than using the microwave). Once melted, stirring frequently, take off the heat and allow to cool down slightly. Take the cake pops out of the fridge and spoon over the candy melts as evenly as possible. Wipe away any excess at their bases. Allow them to set either naturally in the air or if you a pressed for time speed the process up by placing them in the fridge for 5 mins. Once set, you can decorate! I used green icing for the stalk, and black icing for their scary faces! Top tip: these taste FAB with a dash or two of dark rum in the cake pop mix, for those adult Halloween parties. You can choose to make your ginger cake and butter cream from scratch, but I truly recommend using shop bought! That way, the process of making tasty and beautiful cake pops is just that little bit easier and enjoyable as you are guaranteed at the level of quality of the cake pop itself. For the ginger cake, I used two McVities Jamaican Ginger Cakes, and this is reflected in the pricing. I also bought Betty Crocker’s new Buttercream (where in the past I have used her “Frosting”.) This gave a much better texture!